Today I went to a talk with Michelle Williams, hosted by the New York Times Center. It was such an interesting and enlightening talk and I came away convinced that not only is Michelle Williams immensely talented and stunningly gorgeous, but she is introspective, extremely articulate, sensitive, insightful, and in sum a genius. Her manner was so poised, elegant, and poetic, and her conversation really inspired me to be more serious, to try to push myself intellectually, to try to always learn new things, and to approach situations from different angles. In the beginning of the talk, Michelle said she sees herself not as part of some group of filmmakers or some “generation” but as an individual just trying to make her way in the world, taking things day by day and making decisions as they come. She said she always likes to know what’s coming, and that that’s her fatal flaw since you can never know what will happen next in life. She told the small audience, of about 150 people, that “a lot of preparation is the best inspiration.” That’s what she learned from her experience making “Blue Valentine,” which was all improvised. The actors memorized the script, and then the director Derek Cianfrance told them to take every line they’d memorized and forget it all. They had to recreate the story with their own words and actions. The result: a beautiful, heart-wrenching movie and an Oscar nomination for Michelle, which I’m so happy for her for getting!!! Photo by Davi Russo, Weinstein Company. is kind of like Michelle’s second baby. She has been caring about the script since she was 20 years old, when she met the director Derek Cianfrance and they had one of those afternoon coffee, turns into evening dinner and drinks, turns into talking till sunrise kind of New York nights. Over the years, Derek kept making small tweaks to the script, so it was an evolving project that always remained mysterious for Michelle. She never knew what new plot and dialogue changes she’d find when next meeting with Derek. Ryan Gosling was not attached to the project until more recently. 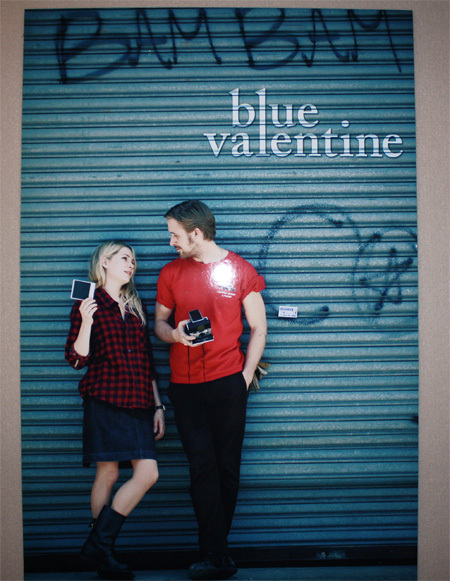 When Ryan broke the news to Michelle, asking her “So how about Blue Valentine”, she thought she’d misheard. After all the years of thinking about the Blue Valentine characters, she had started wondering if the film was just a dream. She was immediately excited that Ryan was on board since she knew from all his past work that he was a wonderful, deeply talented, and serious actor. I’ve decided to start a “be more like Michelle Williams” project. For my first assignment, I’ve ordered the book she cited as her favorite, or by her admission at least the first book that came to her mind. It’s A Field Guide to Getting Lost by Rebecca Solnit. She also cited some poetry by a Russian-sounding poet, whose name started with a N …. but I cannot recall the name. Does anybody know? I will have to inquire around. Michelle said the play La Bette was amazing, too, but unfortunately the New York run ended today, so I’ll have to catch that play in another city. I hope all the lady readers of my blog know that as much as you work on your physical appearance and your fashion style, you should work four times as much on your knowledge, wit, skills, and intellectual capacity. Today I went to a talk with Michelle Williams, hosted by the New York Times Center. It was an interesting and enlightening talk, and I came away convinced that not only is Michelle Williams immensely talented and stunningly gorgeous, but she is introspective, extremely articulate, sensitive, insightful, and in sum a genius. Her manner was so poised, elegant, and poetic, and her conversation really inspired me to be more serious, try to push myself intellectually, try to always learn new things, and to approach situations from different angles. can i please find a job where i am required and paid to live in a house for a month with ryan gosling. btw im going to get a field guide to getting lost too – maybe we can both read and discuss! mini book club! Yes Bryn, definitely! Amazon notified me that the book has shipped, so I’ll start reading in two days, yay! I adore this girl. She is so elegant and smart. I wish there were more starlets that emulated this kind of grace. Love! My copy of Field Guide to Getting Lost arrived in the mail today, so book club is officially on. Yay!